Good Stuff NW: Happy Hour, Indeed! When my pal Dana suggested going to the opening of Tom Miller's show of new prints from his African Queens series at Augen Gallery, I was on board. It wasn't just because I love Tom's work, though that goes without saying. But when she mentioned stopping by 23 Hoyt for a drink and a nosh beforehand, it was a done deal. In the cosmetically made-over location of the over-the-top, corporatized Balvo, this place fits its upscale location like a Donna Karan cashmere sweater. 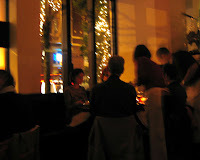 Low lighting and tall windows looking out on the street make you feel like you're part of the scene, and the prices of the appetizers (in groups from $1-6) are easy to scan and very reasonable. 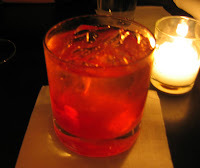 I chose the drink special, an Old-fashioned, a slightly sweet version of this classic bourbon cocktail. Then we chose some roasted almonds and a bowl of spicy fried chickpeas, which I started scarfing like popcorn and enjoyed immensely. Then we chose a grilled goat cheese wrapped in radicchio with tapenade and bread and an order of Indian-spiced chicken skewers. The goat cheese was warm and luscious, and the tapenade had that classic slightly fishy flavor under the salty kalamatas that complemented the creaminess of the chevre. The chicken skewers lacked character in comparison, but were fine if somewhat plain. All in all, a successful outing, quick and satisfying. From the prices on the dinner menu it'll be awhile before (or if) we get there for dinner, but this fit the bill for a pre-event stop. Details: Happy Hour at 23 Hoyt. Tues.-Sat., 5-7 pm. 23 Hoyt, 529 NW 23rd Ave. Phone 503-445-7400.